From past few years, spammers and cyber criminals were buying web extensions from their developers and then updating them without informing their users to inject bulk advertisements into every website user visits in order to generate large revenue. But now they have shifted their business model—instead of investing, spammers have started a new wave of phishing attacks aimed at hijacking popular browser extensions. Just two days ago, we reported how cyber criminals managed to compromise the Chrome Web Store account of a German developer team and hijacked Copyfish extension, and then modified it with ad-injection capabilities to distribute spam correspondence to users. 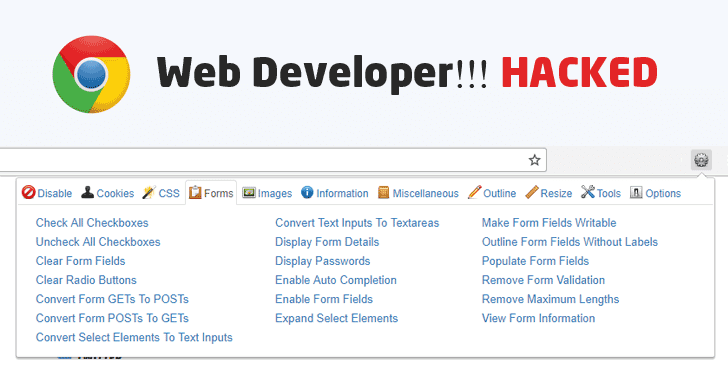 Now just yesterday, another popular Chrome extension 'Web Developer' was hijacked by some unknown attackers, who updated the software to directly inject advertisements into the web browser of over its 1 million users. Chris Pederick, the creator of Web Developer Chrome extension that offers various web development tools to its users, alerted late Wednesday that some unknown hackers apparently phished his Google account, updated the extension to version 0.4.9, and pushed it out to its 1,044,000 users. However, the Firefox version of both the extensions was unaffected. The plugin has access to pretty much everything that's happening on a user's browser—can do anything from reading all the website content to intercept traffic, sniff keystrokes, or any task one can imagine. So, hijacking the Web Developer extension could be a nightmare for users—especially for those who are professional designers and access their official accounts (website, hosting, or email) using the same browser. Pederick said version 0.4.9 of the software might have done worse, but within five to six hours of its compromise, he came to know of the malicious build, pulled it down from the Chrome store, and fixed the extension about an hour later. Web Developer users are strongly recommended to update their extension to version 0.5 immediately. Users should also consider changing their passwords for all web accounts, as well as nullify login tokens and cookies used on websites they visited while using the infected extension.